A decommissioned Czechoslovak soldier named Viktor returns to his homeland from the Western Front after spending much of the war employed at a RAF desk job. He is being appointed the caretaker of an empty manor, formerly occupied by a German family of a notorious Nazi warcriminal imprisoned by the authorities. The soldier meets this criminal beautiful daughter Adelheid, sister of an SS officer who disappeared in the Eastern Front. She works as a cleaning lady at her own mansion. Viktor falls in love with her. His heart is torn between feelings of desire and his national identity and sympathies. However, Adelheid silently waits for her brother to return, which he does. František Vláčil was born in Český Těšín. He spent his childhood and early adulthood in Northern Moravia and Brno. He demonstrated artistic talent at a very young age. After the Second World War he began his studies of aesthetics and art history at the Philosophical Faculty of Masaryk University in Brno. At the time, he joined a group that made animated films, particularly puppet films. He graduated from university in 1949 and moved to Prague where he worked for the Czechoslovakian Army Film Division for the next seven years. At the start of his career, Vláčil, whose subsequent films are deemed highly aesthetic and lyrical, made commissioned, instructional and propaganda films. Nevertheless, these films demonstrate extraordinary creativity. The first liveaction film he worked on was Tank Brigade (1955) by director Ivo Toman, where he was assistant director in charge of a battle scene involving 3,000 extras. His first independent live-action short film, Clouds of Glass (1957) was inspired by a lyrical poem, filmed in colour, and is about a boy obsessed with flying. The first feature length acted film by František Vláčil, The White Dove (1960), follows the flight of a carrier pigeon. Instead on a Baltic island, the pigeon lands in Czechoslovakia when it accidentally got wounded by a boy in wheelchair. Film history considers this black-and-white film with symbolical imagery the predecessor of the Czechoslovak New Wave. The film was screened at the Venice Film Festival and received awards at several international festivals. The success of The White Dove enabled Vláčil to work on large productions. At the same time, Vláčil drops the lyrical string he had been following up to then and turns to epic. The plot of the movie The Devil’s Trap (1962), situated in the 16th century at the time of the Reformation, tells a tale of a miller and his son who come under suspicion of witchcraft because of the rumours spread by the local regent envious of their wealth and reputation. The subsequent Vláčil’s film Marketa Lazarova (1967) is considered to be his master-piece. Writing the script alone took three years; filming and editing took another three. In today’s market conditions, this medieval fresco about the conversion of pagans to Christianity could probably never be filmed. According to the majority of film critics and filmmakers, this is the best film of the Czechoslovak production. Valley of the Bees (1968) is also set in the Middle Ages and tells about religious fanaticism of a knights order. It was followed by Adelheid (1970), the first feature-length colour film in František Vláčil’s filmography which deals with the destiny of Sudeten Germans after the Second World War. After Adelheid, Vláčil was not favoured by the state authorities, so he spent some time making short films for children and a short film about the Art Nouveau of Prague. His comeback film Smoke on the Potato Fields (1976) is a simple, lyrical story about a physician who moves to the countryside after his wife moves abroad. Shadows of a Hot Summer (1977) is a tense drama about a peaceful farmer who had five bandits invade his house. This film, one of the two awarded with Grand Prix at Karlovy Vary Film Festival the same year, is sometimes described as “Moravian Straw Dogs“. Films from the final phase of Vláčil’s career were rarely screened outside Czechoslovakia. Amongst other things, he made a biopic about the composer Antonín Dvořák Concert at the End of Summer (1979). Vláčil received an award for lifelong work at Karlovy Vary in 1998 and Marketa Lazarova was awarded the best Czech film of all times. 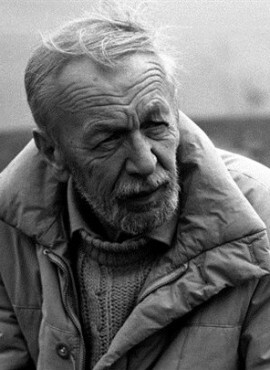 “Poet and thinker of film images”, František Vláčil died on January 28, 1999 in Prague, not living to be seventy-five.